All love stories are crafted differently, so why settle for a car that’s reminiscent of the same old love? 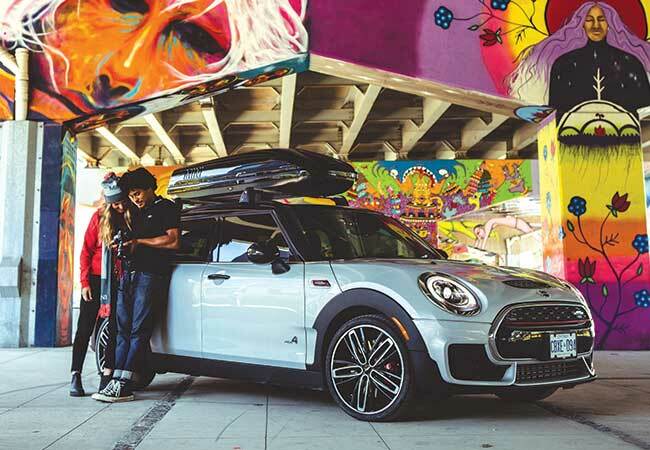 To ring in one of the sweetest times of the year, our MINI Team dives deep into all the ways you can customize your MINI to accurately reflect the one-of-a-kind kind of romance for your MINIac in crime. Since the possibilities of MINI customization are endless, we’re going to have a little fun with offering you suggestions, matchmaker style. Are you ready for it? Answer the short quiz below! You and your partner just won a trip to anywhere in the world! Where do you go? Somewhere cold, we love the snow. Somewhere hot, bring on the beach vibes. Somewhere not too hot and not too cold – we’re indecisive. What are your thoughts on couple’s fitness routines? Gross – We’d rather enjoy our own company under wraps and some hot tea. We’re only down for outdoor activities – treadmills are too boring. What’s your perfect Valentine’s date night? A classic candle-lit dinner and a movie in a private cinema. We’re striking gold by going bowling and zipping through the city at night. Champagne crawl – variety is the spice of life! What do you like the most about your partner’s personality? What are the best type of trips? An overseas one! London, here we come. Road trips! Route 64 is on our bucket list. Staycations. Being a tourist in your own city is more fun than you think! The Head-Up Display gives you all the information you want to know at a glance, reducing distractions and increasing safety. On top of that, you can even sync your phone with it and show relevant messages on the display as well. For an even more lavish ambience in your car, we recommend the electronic windshield defroster, British Oak Chester leather, and anthracite headliner as enhancing options that will completely alter your daily drive. During the chilly season, nothing is more convenient than having windows automatically defrost themselves in a matter of seconds. The British Oak Chester leather, defined by its fine diamond stitching, is also a MINI favourite that elevates the driving game drastically. For more seductive vibes, the anthracite headliner is a game-changer. If your interior is two-toned, adding a bit more shadow can also make your car look a bit more put together as well. In addition to the dark motif, the piano black accessories (gas cap, car handles) will also punctuate your exterior aesthetic with a classic modern style. It’s a total given: wheels are meant to be changed for functionality. However, aesthetically, the Thrill Spokes give your look the sporty and furious vibes you might be craving. Also, if you’re a total racing junkie, then pop off your day to day mirror caps and slap on something a little more fun, this way you can spot your car during any adventure! Since you’ll be into lots of travelling, we found that a fitted luggage compartment would be suitable for your needs, as well as a roof rack base support for any extra cargo you’re thinking of bringing with you. For added protection, we also recommend our roof box to store your belongings up top, but the rack base should be fine for the average trip with your partner in crime. We also threw in the suggestion to go for checkered flag decals for your tops and mirrors. True to our racing history, this pattern makes our hearts race for more adventure, and we hope it does the same for you too! As Vancouverites, our love for the mountains is almost as deep as the one we have for our significant other. It’s really close to true love. In our best conscience, we think that all snow-bunny couples should add excitement to their MINI with a ski and snowboard holder to make your weekend workouts that much better—say goodbye to awkwardly stuffing equipment in the trunk for the better! There’s also nothing more romantic than sharing views of BC’s natural beauty under some throw blankets and a warm beverage at hand. Now imagine doing it on the picnic bench of a MINI. Perfection. Vancouver weather, stay prepared for any circumstance with Alloygator Wheel Protectors that help protect your rims and tires from scratches and accidents. The Gator takes the impact, not your expensive rims! In addition, you will also want all-weather floor mats and a MINI water bottle to stay hydrated with all the in-city activities you’ll be enjoying for the best date ever.